Your subscribers receive more emails in their inboxes than ever before (we all do, really). Sending the same types of messages every week makes it more likely your audience will start unsubscribing. If you want to increase your engagement rates and see more conversions from your email list, then it’s time to revamp your email marketing strategy. We’ve collected 5 of the best tips and tricks you can start implementing today that will help make your email marketing more effective! What makes your customers open your email over the hundreds of others in their inbox? The subject line is often overlooked but one of the most important parts of every email. If it gets deleted before they open it, then it doesn’t matter how great the content inside the email is! If your email is focusing on trending products, features, or even popular colors be sure to showcase that in the subject line. Think of a short and sweet description that makes people excited to see what’s inside but make sure it’s always accurate! People don’t like to be tricked and using clickbait in your subject line is a sure way to get flagged as spam. Once they’ve opened the email thanks to your amazing subject line, they want to quickly get the gist of the email by looking at the pictures and scanning the text. 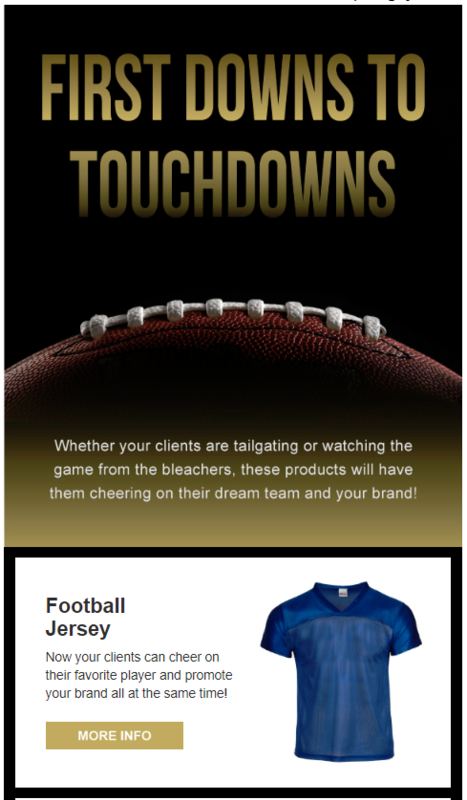 If you promised to show them the best products for football season, then the products should be the focal point of the email with short and sweet descriptions and easy-to-follow action buttons. No one wants to read a lengthy intro paragraph before getting to the purpose of the email. Keep each section down to one or two sentences and focus on the products. Each email that your company sends should have one specific purpose. Whether it’s to inform, inspire, or promote, it’s important to narrow down your focus early on in the design process. You don’t want to add every product under the sun to your email because people will never find what they’re looking for! 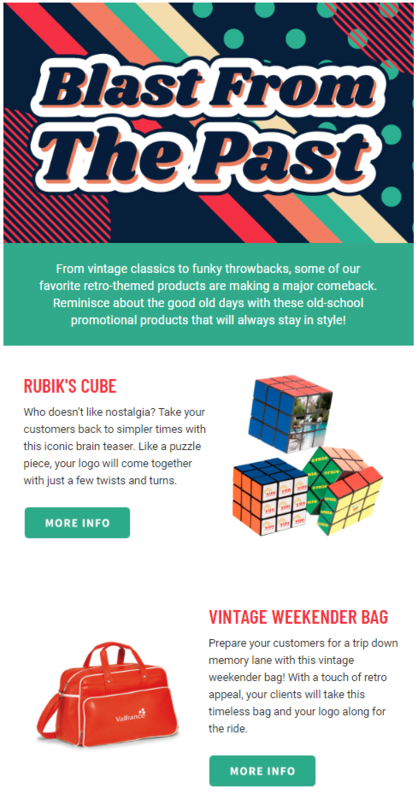 By sticking to your theme, you’ll have a cohesive email design and you can showcase the best and most popular products in that category. Need some inspiration on what to send your customers this month? Check out all the predesigned emails available in SAGE Online. 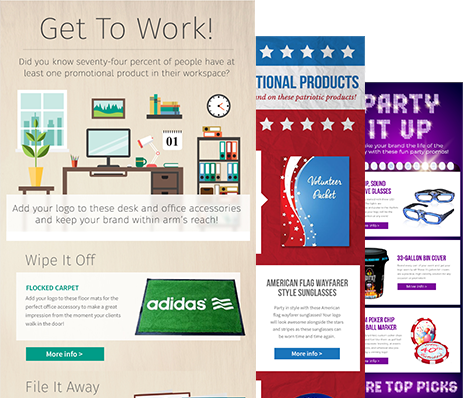 You’ll find a wide range of email themes for every occasion! Don’t get stuck in a “send it and forget it” mentality, every email can provide you great feedback into what is working for your audience. You can use your open rates to see if your subject lines are enticing customers to open your emails, or find out what days and times your emails get the most engagement. If you have a lower open rate on a Sunday morning and through-the-roof engagement on a Wednesday afternoon, you’ll know when to schedule the next campaign to reach more people. Are people opening your email but not clicking on any of your call-to-action buttons? You might have too much descriptive text or not enough content that your customers are interested in. The click-through rate (CTR) can tell you more about the content of the email and help you focus on what your readers are really interested in. 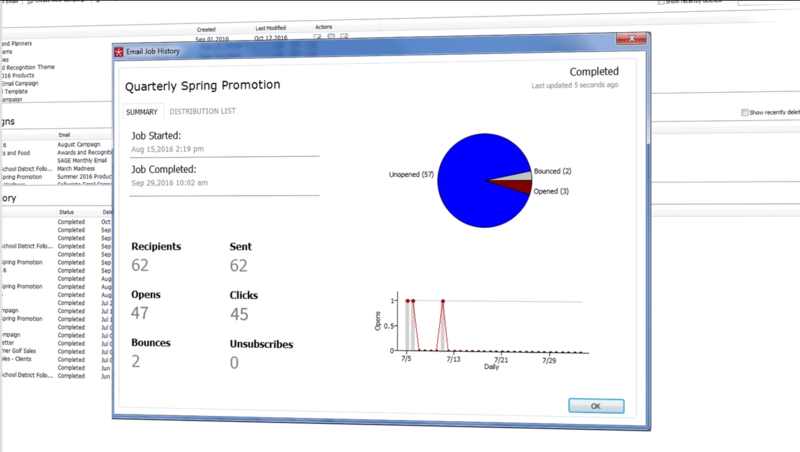 When you send out one of our email campaigns in SAGE Online you’ll get a real-time report on the number of opens, clicks, bounces, and unsubscribes so you can better understand your audience. Every email isn’t necessarily great for every customer on your email list. If you have an email about school spirit products it might be really great for customers in the education industry but maybe not so much for a construction company. You can segment by industry, location, or even separate lists for prospective customers and customers who have ordered recently. Segmenting is a great way to make sure all your customers are getting the content that is most relevant to them and keeps your email list engaged. If you need help implementing these tips into your current email marketing strategy, SAGE Online has tons of beautiful predesigned emails that are themed around various seasons, holidays, industries, and more. And to top it off, if you have a SAGE Website, when your recipient clicks on a product, they’ll be taken directly to that product on your website, making conversion easy! Check out the pricing and see some of the designs available now! I like the idea of a segmented list. Can we pull a list on Sage email marketing for a segmented list.? Thanks for dropping us a comment, Kathy. I passed along your question to your account executive, Terri. I believe she got in touch with you on it. Feel free to let us know if you have other questions! We love hearing from you.